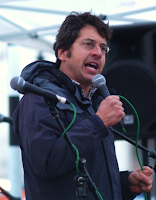 George Monbiot is a thinker with a global perspective I like to follow, and he recently wrote an excellent piece on the long-term reasons for the Britain’s mounting woes. In summary, his scathing theory is that empire-less Britain has run out of foreign peoples willing to be exploited. “The current political crisis has little to do with the expenses scandal, still less to do with Gordon Brown’s leadership. It arises because our economic system can no longer extract wealth from other nations,” he says. It’s a plausible hypothesis, both academically honest and one that is sure to make uncomfortable reading for many of those who proudly call themselves British. Many who consider themselves Scots rather than British might take issue with it too, not only with Monbiot’s assertion that the metropolis has run out of colonies, but with his conclusion that the United Kingdom is the final stage of its disintegration. They might argue that – with Scottish independence a real possibility – the UK’s demise still has further to go, and that what remains of London’s imperial structure is now squarely focused on asset-stripping Scotland of her oil revenues while it still can. The question is, are they right? Has Scotland become little more than a colony for the Southeast of England? Surely, with her own parliament, any argument for Scotland being a colony should now be dead. So what evidence is there for this outlandish claim? As one might expect, their argument hinges on the London’s relentless extraction of Scottish oil and gas wealth and its repeated refusal to reinvest a penny of this windfall back in Scotland. (1) This is a fact whether one agrees with the policy or not, but is it enough to justify calling Scotland a colony? Most counter-arguments to the argument that Scotland is a colony are poorly thought out and predictable. “What rubbish!” the Scottish Unionist defiantly retorts. He (it’s usually a ‘he’) will tell you how well Scotland’s economy did from the Union (eventually, anyway, after the forty years of ensuing economic stagnation), and how many Scots achieved positions of power in the imperial apparatus which, he will be at pains to point out, was most certainly NOT exclusively English. Indeed, the Scottish Unionist’s hackles can always be relied upon to rise when an Englishman lazily cites the imperial achievements of England. If the British nationalist (giving the Scottish Unionist his proper name) knows his history, he will explain to the patriotic Englishman that Scotland was in fact on the ‘executive committee’ of the Empire, and remind him politely of imperial power-wielders such as Henry Dundas, key colonial governors like Australia’s Lachlan Macquarie, accomplished military leaders such as Colin Campbell, and great explorers like Alexander MacKenzie, James Bruce and David Livingstone. Desperate to prove his British credentials to his fellow Brit, he will no doubt remind the yawning Englishman of the Thin Red Line at Balaclava, of Colin Campbell’s relief of Lucknow, of the Highlanders who gave Wolfe his victory in Quebec, and of the Lowlanders and Highlanders facing Napoleon as one at Quatre Bras. “Sure,” the Englishman will reply, glancing at his watch. “That’s all very well, but as far as the rest of the world is concerned, they were fighting for England.” And he would be right. Explorers, governors, missionaries, bureaucrats, merchants, soldiers: this is the glorious (if anachronistic and irrelevant) imperial history to which the Scottish Unionist clings in his denial of Scotland’s need to be a nation in her own right. Having felt some pride in this imperial history myself, it’s hard not to feel at least some sympathy for his predicament: emotionally – and logically – it must be difficult to proudly and patriotically boast to Englishmen and foreigners of Scotland's imperial record, only to deny in your next breath that this pride is in any way nationalistic. Something doesn’t add up. It’s because it is the rhetoric of the servant. All fair points, diehard Unionists will say, balanced by the success Scots enjoyed as equal partners in the Empire. Many Scots may have suffered – as did many of those who Scots helped subjugate (9) – but enterprising Scots did very well from the Empire too. Perhaps. The role of Scots throughout the imperial period is a complex one, and your opinion on it is probably as much a reflection of your perceived national identity as of your politics, or your opinion of empires in general. That the Scots were enthusiastic participants in colonisation – of our own people as well as others – is undeniable. Let’s just say that there were many shameful aspects in the roles of Scots in the Empire, which may be balanced by philanthropic and benevolent roles played elsewhere. Time and healthy debate will tell. That’s why Monbiot is right when he connects the UK’s current troubles with the end of Empire. His only error is to see the process as over, and the lingering mini-Empire of the British state as the smallest unit of post-imperial disintegration. The reality is that the Empire is still alive and kicking, and that Britain’s decline still has one more step to go – the independence of Scotland. (1) Tom Gordon, ‘Alex Salmond Fuels Flames of Oil Crisis,’ TimesOnline, June 1, 2008. Even the Calman Commission’s recent report recognised that 90% of British oil revenues belong to Scotland. (2)The riots that occurred in 1707 in the streets of Scotland with English forces standing by at the border are testament to the forced nature of the Union (Magnus Magnusson, Scotland: The Story of a Nation, HarperCollins, London, 2000, p548), a fact which Scottish Unionists can only dismiss with bland statements such as ‘our leaders chose it.’ This is a disingenuous argument. If Scotland signed up for a voluntary union, then surely it is equally acceptable to leave it. And if she is part of a forced union, then why the Scottish Unionist pretence of friendly federalism? Which is it? If the 1320 Declaration of Arbroath was an assertion of the sovereignty of the Scottish people, then our leaders agreeing to the 1707 Act of Union was clearly a violation of this. See Paul Henderson Scott’s excellent summary of the background to the Act in The Union of 1707: why and how?, The Saltire Society, Edinburgh, 2006. (3) See Michael Lynch, Scotland: A New History, Pimlico, London, 1992, p328. This statement, as expressed by their eventual commander, clearly reveals the cold, expoitative calculation that lay behind the recruitment of Scottish Highland regiments into the British army post-Culloden, even though it was the Earl of Albemarle who was to eventually suggest the idea to William Pitt. (6) Some scholars argue that the first Duke of Sutherland in fact made a loss on the enormous personal investment he made in the destruction of Sutherland's Highland society, as if the failure of his financial venture somehow made him the victim. (8) Some may say ‘so what?’, but can you imagine the English reaction to Scottish troops being used to quell political demonstrations on the streets of London, Leeds or Liverpool? (9) The Chinese, for example, suffered greatly from the opium trade, to which Scottish opium barons such as Sir James Matheson contributed significantly. (10) This uses an oil price of $60 a barrel, the price as of July, 2009. This is quite conservative, considering that just one year ago it reached $145/bbl. (11) The best summary of this process is the recent BBC documentary Diomhair. I’ve given a link to part 1 below, but due to the BBC’s repeated attempts to prevent its availability via legal writ, this may not work after a while, so the best way to locate it is by a simple Google search on either YouTube or GoogleVideo. (12) Eddie Barnes, ‘Role of Scottish Secretary Will Survive Reshuffle,’ Scotsman, September 28, 2008. (13) On May 6, 2009, Bob Ainsworth, Armed Forced Minister, announced to the British Parliament that the entire nuclear submarine fleet would be based in Scotland by 2017. (14) Angus MacLeod, ‘Election Shambles Verdict: the voters lost,’ TimesOnline, October 24, 2007. (16) Eddie Barnes, ‘Olympics robs Scots of Lottery cash,’ Scotland on Sunday, November, 23, 2008. (17) Joan MacAlpine, ‘British if you win, Scottish if you lose,’ TimesOnline, July 5, 2009. (19) Daily Record, ‘Defence contract guarantees Clyde work for 15 years,’ July 2, 2009. A colony? Aye we're a colony alright. Good post. One of the best explanations/descriptions of our current predicament, and those around me who will not be returning home post Independence as they prefer the English shilling - sad poor unfortunate fools, let them rot I say. Oil only comes out of the ground at a set rate, hopefully we'll not have been completely raped by the time we break free, but I doubt it! Basic supply and demand economics tells us that the second half of our oil supply - the part that would fall to us if independence came soon - will be worth several times the first half. That said, I honestly don't think we need the oil. There are moral reasons why the situation stinks, but I believe independence is inevitable, and if it made sense before oil was discovered, it will still make sense after it has run out. In fact, I am starting to wish we didn't have it. It might make breaking free of this Union a whole lot easier.